Just noticed something wrong with the bunk bed. See photos below. Is the bed failing? I am really concerned as my kids are sleeping on the lower bed. The upper bed capacity appears to to be 600 lbs. We have occasionally somebody sleeping there. He is around 220 lbs, so not even close to the declared capacity. Any way to check the condition of the bed? This is already second major issue I noticed just after my warranty expired in August his year. First was a bolt coming from the floor. One thing to remember about a capacity rating is it refers to a loading evenly distributed over an entire area. If a 220# individual concentrates their weight in one spot then that area can easily be over loaded. Apart from the fact that (as I mentioned) the front of the bed is flexing when you are climbing on the bed (then the total weight hangs in the front of the bed), I do not know how to evenly distribute weight of an adult over the bed. Should an adult sleep with arms and legs spread out? I have to really question the 600# weight limit. I have a 2013 28BHBE with full size bunks. My son has always slept on the top bunk, but now that he’s 17 years old, 6 feet and 200#, that bunk is awful creaky. Scares the hell out of us with our daughter sleeping on the bottom bunk. We are trying to get them to switch places now. I agree. A 600 lb rating should hold 200 lbs. Distributed loads are for things like snow loads an a roof. Time to get some wood and shore that thing up. If you don't feel comfortable yourself, I'd contact a general carpenter to take a look. I'm sure a good carpenter would do a much better job strengthening that than a dealer would. I guess I am missing something in the images. All I see is some trim that looks like it was pulled out. Sliding in and out while rubbing on the trim can do that. The front of the bed is pushing the trim out. In fact, the front of the bed is lower now, so I cannot put the trim back in place. I don’t have your model, so I am not sure... From the pictures, it looks like the floor of the bed is supported by horizontal angle members (angle bracket) where you can only see the bottom edge (but painted?). 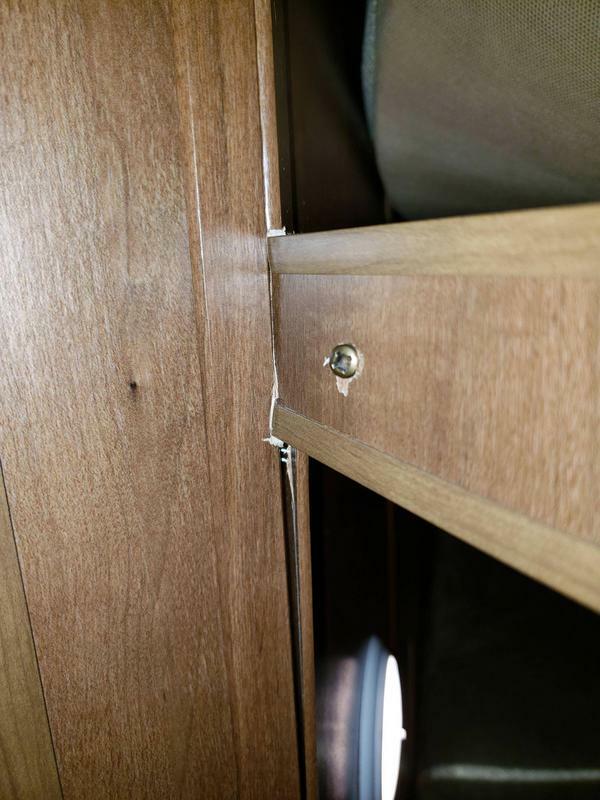 One of the close-ups does not show a bracket where the bed floor makes an angle. 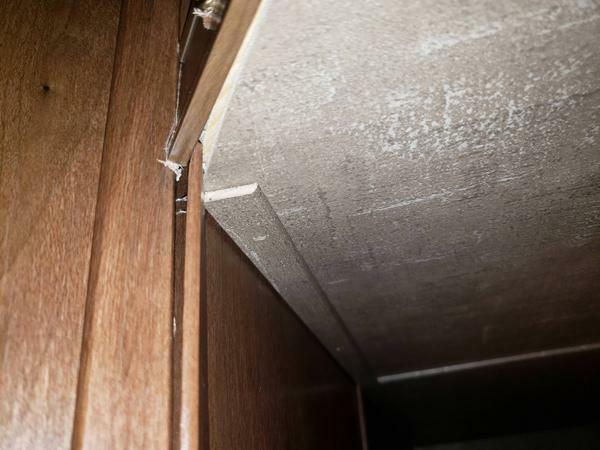 I have to wonder if the existing brackets were screwed into the wood frame behind the paneling. Also, the rail that goes across the front should be supported by a vertical member to the floor on each end, I would think. That said, I am not sure if the floor could handle a point load. Your warranty expired in August, its just now October. I would contact Jayco and send them pictures and request that they look into this. From my experience, Jayco has been pretty receptive to customers and might be willing to help you out. Don't go to a dealer first... go directly to Jayco.